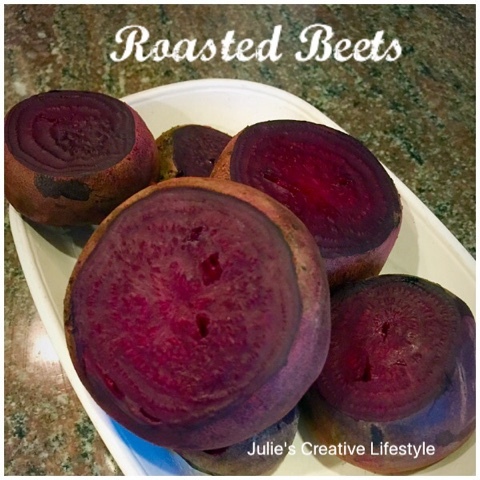 Roasting beets are a great vegetable to eat all year round, and they can be used alone or in salads. 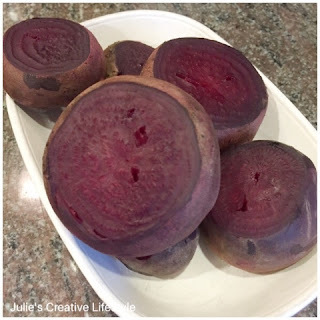 I recently made roasted beets, and they are so easy to make and taste great. Some people like to boil them, but I find this way to make them very easy. Here are the easy steps to make roasted beets. 1) Cut the stems off of the ends of beets. 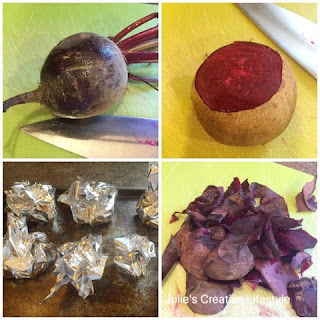 2) Wrap each beet in aluminum foil and place on tray. 3) Roast beets in oven at 400 degrees F.
4) When beets cool, cut off the skin of each beet. This is a quick and easy recipe to make roasted beets. 1. Heat oven to 400 degrees F.2. Slice off beet leaves from each end of beets. Scrub beets thoroughly and then wrap each one with foil. 3. Transfer wrapped beets to baking sheet. Roast for 50-60 minutes. Beets are done when fork slides easily into beets. Wishing you a wonderful end of the week and weekend. Jess and I will see you all back here Monday for our Cooking and Crafting with J & J Link Up! They are the one vegetable I don't like. I keep trying them, hoping one day I will like them. I can't figure out why. They come in so many salads and things, I wish I did like them!! Roasting is the way to go for sure! Mmmmmm! Roasted beets is one of my favorite ways to have them, especially sliced in a salad with some goat cheese. YUM! I love roasted beets. They are by far one of my favorite things to put in salads or eat just plain. I don't usually wrap them in foil though. Just curious about the purpose of that? I love roasted beets cut up in salads. Yummy. Happy Friday. They have such an amazing flavour when they are roasted don't they. I just love beets and always steam them on the top of the stove. They must be fabulous roasted! Thanks! I love beets! But never tried to roast them. This seems very easy and I can't wait to try. Thanks for sharing Julie. I finally have a bit to blog reading time today. Love it! !